The goal of this was to simply render an interesting scene in OpenGL. To be honest, I saw my friend doing this for his assignment in a Computer Graphics course and I decided to do one myself just for fun. 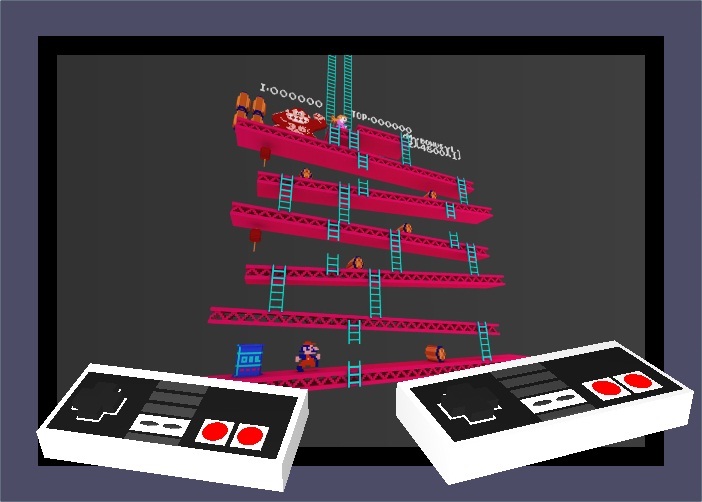 The NES controllers were modelled using predefined primitives provided by GLUT and GLU. The background is a quad textured with a 3D interpretation of Donkey Kong on the NES. You can find the original image of the background here along with other interesting works from Dotter Dotter. Added in lighting and material and called it a day with this one. I really like this scene. For me the Nintendo controller holds a lot of significance because it introduced me to the world of video games. Although my family owned an Atari 2600, I consider the Nintendo Entertainment System to be my first real taste at console gaming. I remember sometimes my older brothers wouldn’t let me play the Nintendo. So instead I would sit on the couch, hold onto a game cartridge, and imagine how the game would play out.